I am one of many northern New York DJs, providing high quality entertainment, with little twists not always present with other entertainers. The biggest uniqueness is the old school style of DJing combined with today’s technologies. Continuous music mixing is the best way to keep the dancefloor moving, with a high end dual cd players along with digital turntables (CD versions of the vinyl legends) there's never any dead air between songs that can slow the pace of a good party. With 20,000+ songs in my extensive music collection, as well some of the most unique remixes and medleys in the business, the music can cover the 50s to today and never miss a beat. Lighting is also a wonderful way to choose one DJ over another. Several lighting effects of various types, including the newest in LED technology, are also a part of my show. Music & lighting are synchronized to create the proper atmosphere. 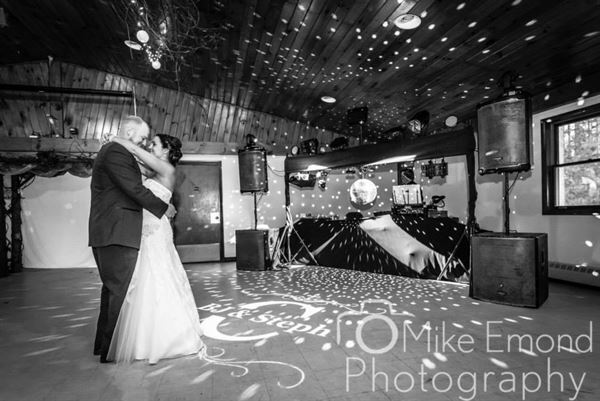 From mirror ball scattered dots filling the room for when the bride and groom have their first dance as a married couple, to a room filling, club-style array of bouncing beams of light for when the crowd really gets the dance floor moving. Since 1996, I have enjoyed being able to provide services to hundreds of events of all types, taking pleasure in being able to help make every one of them a huge success. This is pricing for base wedding package to premium package. Please provide specifics of your event, location, ceremony music needed, etc. so a more accurate quote for your event can be made.